Air Date: Friday, May 18 (9:01-10:01 p.m. EDT), on ABC. “The Force of Gravity” was written by Drew Z. Greenberg & Craig Titley and directed by Kevin Tancharoen. Air Date: Friday, May 11 (9:01-10:01 p.m. EDT), on ABC. “The One Who Will Save Us All” was written by Brent Fletcher and directed by Cherie Gierhart. Air Date: Friday, May 4 (9:01-10:01 p.m. EDT), on ABC. Air Date: Friday, April 27 (9:01-10:01 p.m. EDT), on ABC. Marvel’s Agents of S.H.I.E.L.D stars Clark Gregg as Agent Phil Coulson, Ming-Na Wen as Agent Melinda May, Chloe Bennet as Daisy Johnson, Iain De Caestecker as Agent Leo Fitz, Elizabeth Henstridge as Agent Jemma Simmons, Henry Simmons as Agent Alphonso “Mack” MacKenzie and Natalia Cordova-Buckley as Elena “Yo-Yo” Rodriguez. “All Roads Lead … ” was written by George Kitson and directed by Jennifer Lynch. Air Date: Friday, April 20 (9:01-10:01 p.m. EDT), on ABC. Guest starring are Adrian Pasdar as Brigadier General Glenn Talbot, Jeff Ward as Deke, Catherine Dent as General Hale, Dove Cameron as Ruby, Spencer Treat Clark as Werner Von Strucker, Briana Venskus as Piper, Shontae Saldana as Candice Lee, Raquel Gardner as Carla Talbot and Zach McGowan as Anton Ivanov. “The Honeymoon” was written by James C. Oliver & Sharla Oliver, and directed by Garry A. Brown. Air Date: Friday, April 13 (9:01-10:01 p.m. EDT), on ABC. Guest starring are Adrian Pasdar as Brigadier General Glenn Talbot, Jeff Ward as Deke, Catherine Dent as General Hale, Dove Cameron as Ruby, Brian Patrick Wade as Carl Creel, Maximilian Osinski as Agent Davis, Spencer Treat Clark as Werner Von Strucker, Lola Glaudini as Polly Hinton, Lexy Kolker as Robin Hinton and Aaron Fili as scientist. ”Inside Voices” was written by Mark Leitner and directed by Salli Richardson-Whitfield. Air Date: Friday, April 6 (9:01-10:01 p.m. EDT), on ABC. 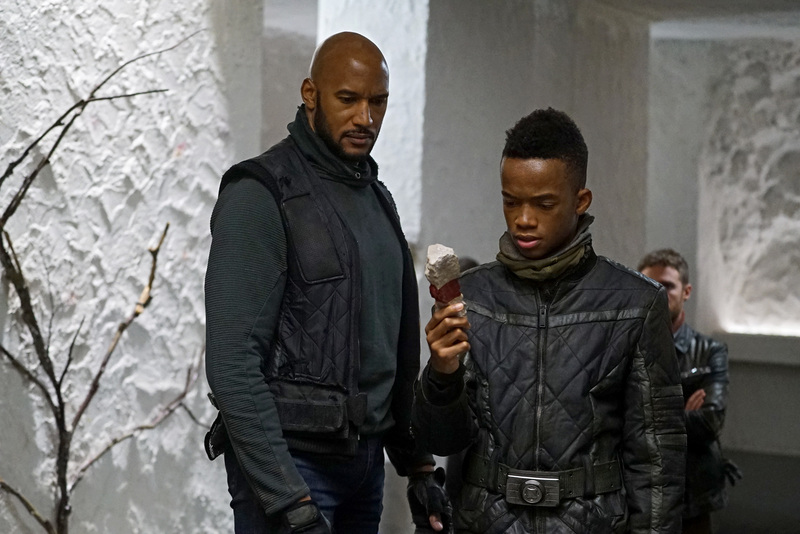 Coulson uncovers General Hale’s true agenda, and it could be the end of the world if S.H.I.E.L.D. doesn’t help her. Air Date: Friday, March 30 (9:01-10:01 p.m. EDT), on ABC. Guest starring are Jeff Ward as Deke, Catherine Dent as General Hale, Brian Patrick Wade as Carl Creel, Briana Venskus as Agent Piper, Peter Mensah as Qovas and Zach McGowan as Anton Ivanov. ”The Devil Complex” was written by Matt Owens and directed by Nina Lopez-Corrado. Air Date: Friday, March 23 (9:01–10:01 p.m. EDT), on ABC. The team goes in search of Gravitonium in order to help save the world. Guest starring are Jeff Ward as Deke, Catherine Dent as General Hale, Dove Cameron as Ruby, Brian Patrick Wade as Carl Creel, Maximilian Osinski as Agent Davis, Spencer Treat Clark as Werner Von Strucker, Shontae Saldana as Candice Lee, Katie Amanda Keane as Deke’s mom, Jake Busey as Tony Caine, Paul Schackman as Dr. Van Kempen and Mark Fite as Getty. ”Principia” was written by Craig Titley and directed by Brad Turner. Air Date: Friday, March 16 (9:01-10:01 p.m. EDT), on ABC. In the milestone 100th episode, Coulson finally reveals the mysterious deal he made with Ghost Rider, which will impact everyone on the S.H.I.E.L.D. team. Air Date: Friday, March 9 (9:01-10:01 p.m. EST), on ABC. Coulson and team set out to rewrite the course of humanity’s fate, but they’re unaware that their efforts will dramatically change one S.H.I.E.L.D agent’s life. Air Date: Friday, March 2 (9:01-10:01 p.m. EST), on ABC. Guest starring are Jeff Ward as Deke, Eve Harlow as Tess, Dominic Rains as Kasius, Florence Faivre as Sinara, Joel Stoffer as Enoch, Max E. Williams as Tye, Coy Stewart as Flint, Tunisha Hubbard as Ava, Ryan R. Moos as Kree doctor, Luke Massey as Hek-Sel and Jay Hunter as Kree watch commander. ”Past Life” was written by DJ Doyle and directed by Eric Laneuville. Air Date: Friday, February 2 (9:00-10:01 p.m. EST), on ABC. Guest starring are Jeff Ward as Deke, Eve Harlow as Tess, Dominic Rains as Kasius, Florence Faivre as Sinara, Joel Stoffer as Enoch, Coy Stewart as Flint, Michael McGrady as Voss, James Harvey Ward as Gunner, Tunisha Hubbard as Ava, Luke Massey as Hek-Sel and Graham Outerbridge as Doyle. ”Best Laid Plans” was written by George Kitson and directed by Garry A. Brown. Air Date: Friday, January 26 (9:00-10:01 p.m. EST), on ABC. Coulson and the team discover that the most unexpected person from S.H.I.E.L.D.’s past may hold the key to stopping Earth’s destruction. Guest starring are Jeff Ward as Deke, Dominic Rains as Kasius, Florence Faivre as Sinara, Joel Stoffer as Enoch, Coy Stewart as Flint, Michael McGrady as Samuel Voss, Tunisha Hubbard as Ava, Willow Hale as Robin Hinton, Ava Kolker as Robin (age 12), Lexy Kolker as Robin (age 7), Jamal Akakpo as comms agent, Michele Tobin as Gretchen and Dusty Sorg as Mouse. ”The Last Day” was written by James C. Oliver and Sharla Oliver and directed by Nina Lopez-Corrado. Air Date: Friday, January 19 (9:00-10:01 p.m. EST), on ABC. Guest starring are Jeff Ward as Deke, Dominic Rains as Kasius, Florence Faivre as Sinara, Joel Stoffer as Enoch, Coy Stewart as Flint, Tunisha Hubbard as Ava, Willow Hale as The Seer, Jay Hunter as watch commander, Isaac C. Singleton Jr. as The Vicar, Samuel Roukin as Faulnak, Remington Hoffman as Maston-Dar and Shon Lange as guard. ”Together or Not at All” was written by Matt Owens and directed by Brad Turner. Air Date: Friday, January 12 (9:00-10:00 p.m. EST), on ABC. Guest starring are Eve Harlow as Tess, Dominic Rains as Kasius, Florence Faivre as Sinara, Joel Stoffer as Enoch, Coy Stewart as Flint, Pruitt Taylor Vince as Grill, Tunisha Hubbard as Ava, Erika Ervin as Lady Karaba, Patrick Fabian as Ponarian, Myko Olivier as Ben, Jay Hunter as watch commander, Tim Sitarz as Kree soldier, Isaac C. Singleton Jr. as The Vicar, Samuel Roukin as Faulnak, Michele Tobin as Gretchen and Remington Hoffman as Maston-Dar. ”Fun & Games” was written by Brent Fletcher and directed by Clark Gregg. Air Date: Friday, January 5 (9:01-10:01 p.m. EST), on ABC. “Rewind” was written by Craig Titley and directed by Jesse Bochco. Air Date: Friday, December 22 (9:01-10:01 p.m. EST), on ABC. Guest starring are Jeff Ward as Deke, Dominic Rains as Kasius, Florence Faivre as Sinara, Max E. Williams as Tye, James Harvey Ward as Stone, Pruitt Taylor Vince as Grill, Rya Kihlstedt as Lady Basha, Tunisha Hubbard as Ava, Myko Olivier as Ben, Torrance Jordan as guard and Mark Rhino Smith as trader leader. Air Date: Friday, December 15 (9:01-10:01 p.m. EST), on ABC. “Orientation (Part One)”/“Orientation (Part Two)” – Coulson and the team find themselves stranded on a mysterious ship in outer space, and that’s just the beginning of the nightmare to come. Guest starring in “Orientation (Part One)” are Jeff Ward as Deke, Joel Stoffer as Enoch, Jordan Preston as driver, Peter Hulne as Jerry, John Wusah as young soldier, Deniz Akdeniz as Virgil, Nathin Butler as Jones and Derek Mears as captain. Guest starring in “Orientation (Part Two)” are Jeff Ward as Deke, Eve Harlow as Tess, Dominic Rains as Kasius, Florence Faivre as Sinara, Paul Duna as Reese, Kaleti Williams as Zev, Pruitt Taylor Vince as Grill, James Babson as Holt, Tunisha Hubbard as Ava, Derek Mears as captain, Wes Armstrong as Rick and Jay Hunter as watch commander. “Orientation (Part One)” was written by Jed Whedon & Maurissa Tancharoen and directed by Jesse Bochco. “Orientation (Part Two)” was written by DJ Doyle and directed by David Solomon. Air Date: Friday, December 1st (8:00-10:01 p.m. EST), on ABC. 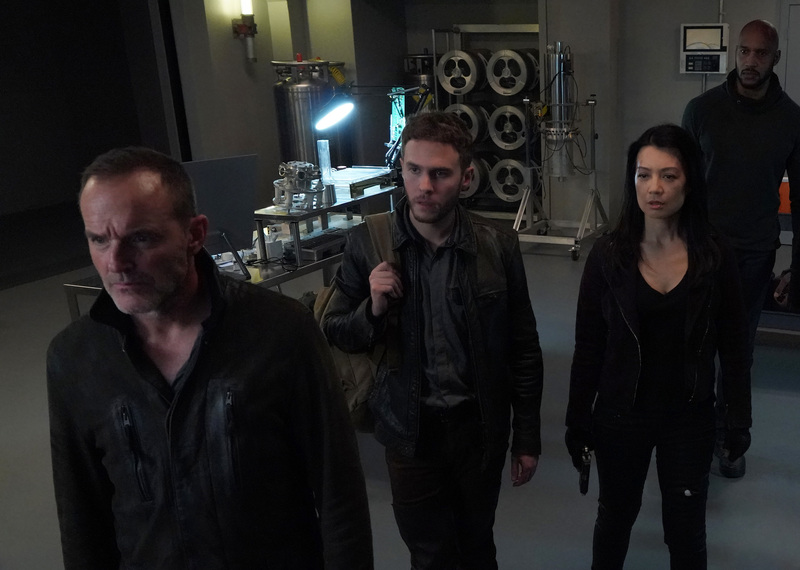 About Marvel’s Agents of S.H.I.E.L.D. Agents of S.H.I.E.L.D. was renewed for a fifth season of 22 episodes by ABC Network on May 11, 2017. The show returns for its fifth season on Friday, December 1 2017.